As the fourth part of our story series looking at the Future of Human Resources, we speak to someone whose company has been carefully studying the workforce of the future, to give us a sense of how we can prepare personally – and future-proof our teams – for the pathways ahead to 2030. If you met Philip Otley, you might forgive him for having one eye on you and one on the horizon. Now the founder of a consultancy called Growth Accelerator, and until recently a Digital Services partner with PwC, Otley has 25 years of brand and commercial strategy consulting experience – with specialties in the technology and digital spheres. He has also spent significant time in recent years delving into the future of work as we know it, thanks in part to PwC’s impressive report, The Workplace of the Future, which looked closely about the “competing forces” shaping the future of work to 2030. Specifically, the report addressed how we should adjust today's priorities to help improve tomorrow’s work landscape. He shared these insights with PageGroup. The key to a successful transition of skillsets to automation is to accept that we will soon use the assistance of greater levels of machine intelligence: which will in turn help us to delve deeper into the supplies of data at our fingertips. “There are elements that you would hope that machines would be better than people at doing – and all indications are that this is going to be the case in the very near future.” These functions include mechanical tasks, and the processing of huge amounts of data for creating and recognising patterns, he says. Another misconception is the idea that only the academic wizards will have successful future careers, an assumption that over-simplifies notions of intellect. “Don’t take it as shorthand that only really ‘bright’ folks will have a role in the future,” he advises. “There are multiple forms of intelligence – and creative intelligence, empathetic intelligence and collaborative intelligence are the sorts of things that we expect will be dialled up in the human jobs of the future”. 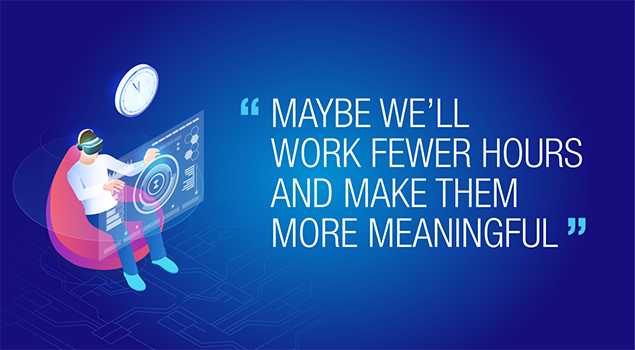 Much has been made of the need for companies in the future to articulate a vision of lifetime learning – one which would see the combining of study functions and work functions in an average working day. Otley says this could also spell the end for another vestige of our corporate workplace: the traditional office, which in many cases closely resembles Don Draper’s mid-1960’s Mad Men era office. “There’s a whole bunch of forward-thinking companies saying that this model is not fit for purpose any more”, says Otley. 10. Could work become more enjoyable? The bottom line of all these scenarios is that the workplace of the future need not be a depressing place. There is the possibility that being more focused on higher-order tasks, and having less control structures limiting our work, might in turn lead to workplaces as happier places. Human capital ROI: How can your business break even or better on new hires?